Karl Marx's articles in the New York Daily Tribune constitute a separate genre among his works, being originally published in English and based on events in various countries in the world. There is no doubt that the work Marx undertook for his Tribune articles not only influenced his later theoretical work (one major result being his incorporation of colonialism as a factor in the genesis and expansion of capitalism), but also gave him an opportunity to apply the general principles of his method of historical materialism to the study of complex circumstances prevalent in different parts of the world. The perception of pre-colonial and colonial India that he put forth in the Tribune is a classic product of such application. 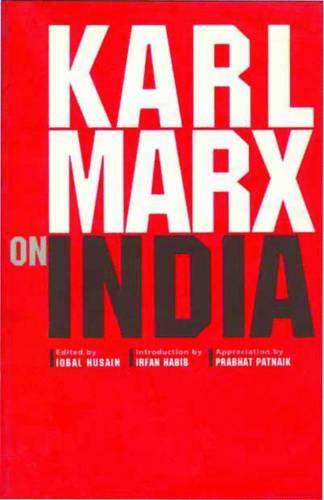 The sheer boldness of Marx's explanation of India's pre-colonial 'non-history'; the remarkable insight into the nature of colonial rule which made it so different from all previous conquests of the country; the lucidity of the exposition of the dialectics of colonial impact; the passionate sympathy for the suffering of the Indians, and, at the same time, the utterly dispassionate account of the historical course that opened up before the country, entirely independent of the will and consciousness of the colonial rulers themselves; all these combine to make the Tribune set of articles a real classic on Indian history. Iqbal Husain has established the text of Marx's articles from the original files of the newspaper in which they appeared. He has also collected the extracts relating to India from the Marx-Engels correspondence during the period of the articles. Prabhat Patnaik has written a special Appreciation of what Marx's articles on India add to our understanding of his ideas and approach.